Rock a mint cardigan with ASOS DESIGN asos extreme super skinny jeans in mid wash with rips and for a weekend-friendly look. Up the ante of your outfit with olive camouflage canvas loafers. For a comfortable-as-your-couch outfit, dress in a black leather bomber jacket and ASOS DESIGN asos extreme super skinny jeans in mid wash with rips and. Up the cool of your getup by wearing mustard suede brogues. 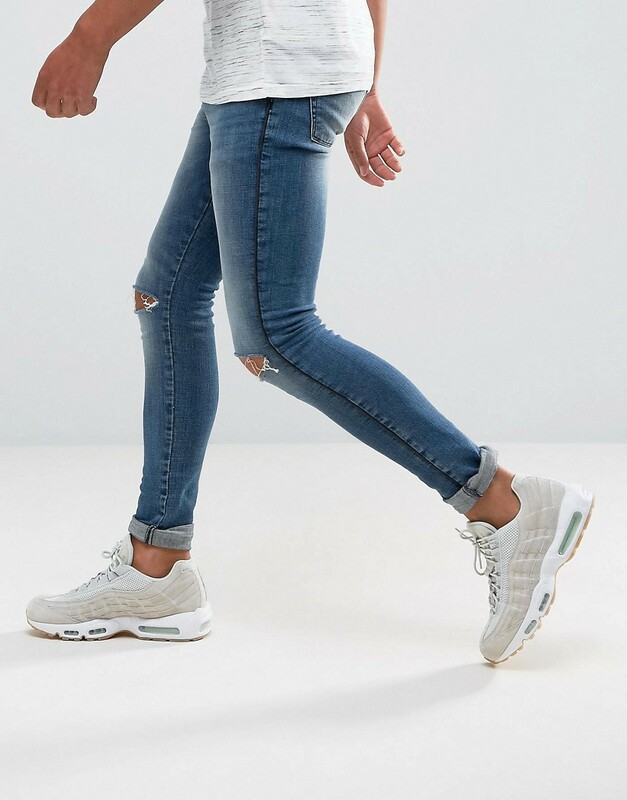 If you're all about relaxed dressing when it comes to fashion, you'll love this easy pairing of a white wool blazer and ASOS DESIGN asos extreme super skinny jeans in mid wash with rips and. 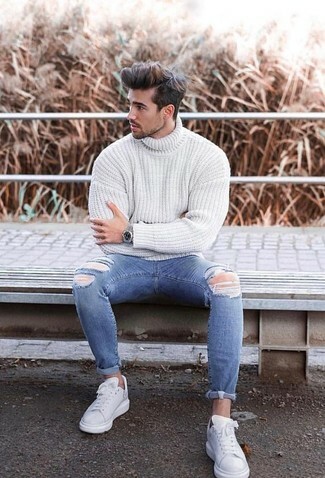 Opt for a white knit turtleneck and ASOS DESIGN asos extreme super skinny jeans in mid wash with rips and from Asos, if you feel like relaxed dressing without looking like a hobo. You could perhaps get a little creative in the footwear department and dress up your outfit with white leather low top sneakers. If you're all about relaxed dressing when it comes to fashion, you'll love this simple combo of a burgundy print crew-neck sweater and ASOS DESIGN asos extreme super skinny jeans in mid wash with rips and. And if you want to instantly up the style of your look with one piece, enter burgundy suede low top sneakers into the equation. 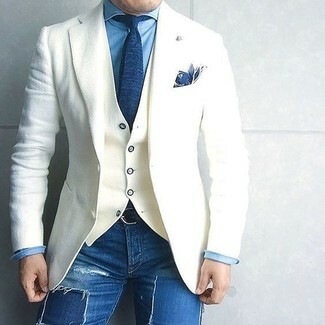 Go for a blue linen blazer and ASOS DESIGN asos extreme super skinny jeans in mid wash with rips and from Asos, if you want to dress for comfort without looking like a hobo. Channel your inner Ryan Gosling and make brown leather oxford shoes your footwear choice to class up your outfit. If you're in search of a casual yet seriously stylish getup, go for an olive overcoat and blue ripped skinny jeans. Both garments are totally comfortable and will look great together. 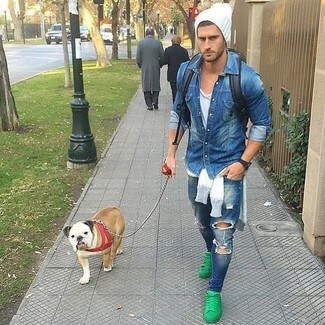 Consider teaming a light blue v-neck sweater with blue ripped skinny jeans, if you want to dress for comfort without looking like you don't care. Spruce up your outfit with green low top sneakers. 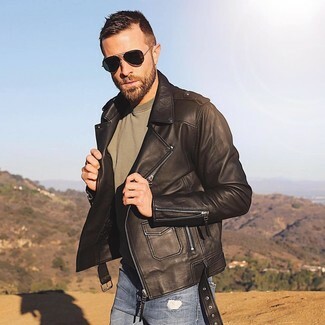 To assemble a casual ensemble with an edgy finish, you can easily opt for a dark brown leather biker jacket and ASOS DESIGN Asos Extreme Super Skinny Jeans In Mid Wash With Rips And.